West Spiral is the end of the spirals composition both metaphorically and geographically --representing the setting the Sun and marking the West limit of Sun Axis. Its center is defined by a naked eye observatory and located approximately 2057 feet west and 86 feet north of the North Monument, on the highest topographic point of Sunset Farm, at elevation 810 feet. 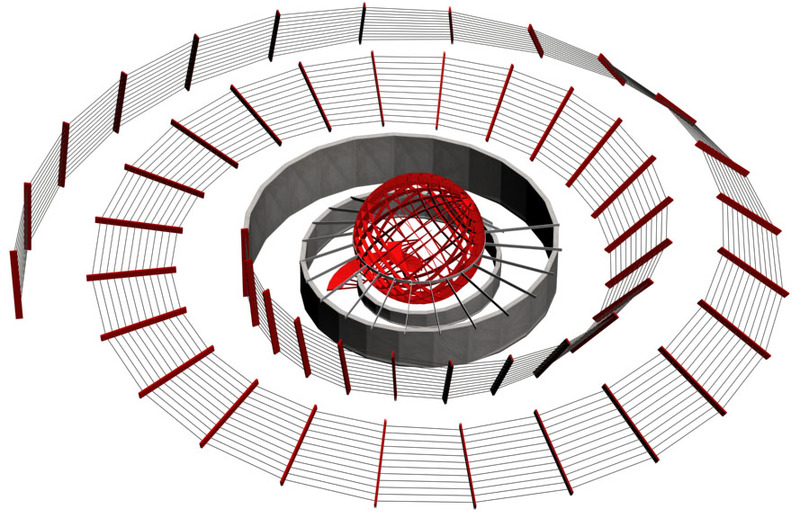 Its shape is based on the Archimedes' spiral. Each point of the spiral is identified by a steel column supporting a cable net. Each column is titlted at a different angle to generate a Moebius strip, a topological shape which turns inside-out and upside-down, a metaphor for the day-night cycle. The innermost cycle of the spiral is a sloping concrete wall holding steel plates to support the Observatory. The perception of West Spiral unfolds through the act of walking between two consecutive cycles. At the most inner cycle the observer continues his walk into a ramp leading to the Observatory, concluding the path from day to night.